I don't usually review the Topshop Unique show. I've photographed the street-style outside the show twice. Once at the Tate Modern, last February (Fall 2014). The second was in September, outside the Queen Elizabeth II Conference Centre, for Spring 2016. Socialites, Poppy Delevingne, Alexa Chung, Atlanta de Cadenet, DJ Leigh Lezark, Anna Wintour and more all descended upon Broad Sanctuary for a Unique display that was arguably the strongest one to date. Kate Phelan, creative director of Unique, was inspired by the "bad girls" of Britain. A loose inspiration, decidedly, but it did make for a great show. The naughty Unique girls hit the runway with an effortless sassiness. The first slew of looks incorporated polka-dots. The beautiful Lineisy Montero prowled the catwalk in her faux-leather coat and navy and peach, polka-dot romper. The sexiness of a women wearing men's clothing also provided inspiration. Marga Esquivel wore an oversized blazer with rolled up sleeves. There were oversized blouses and baggy trousers. 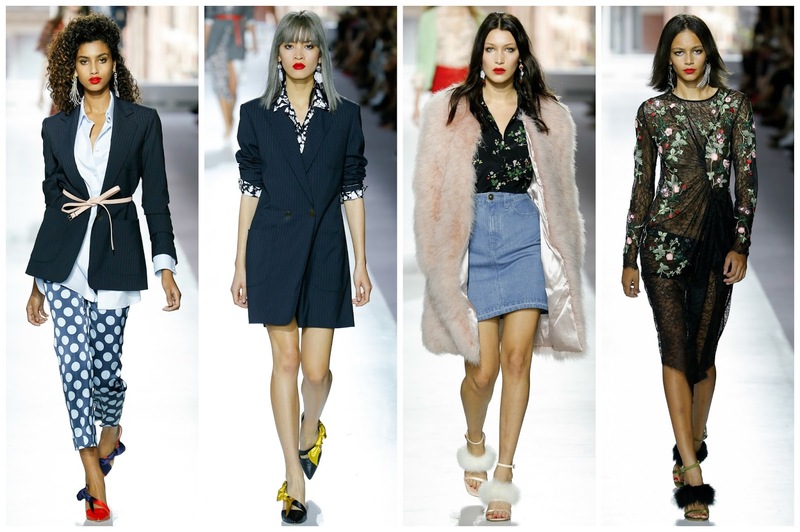 The 70’s influence was evident in Bella Hadid’s floral printed blouse, paired with a denim skirt and fur coat. Another look consisted of a mint wool cardigan, floral printed shirt and a faux-leather flame red skirt. Floral embroidered lace dresses also echoed the 70’s statement. What's perfect about Topshop's choice of models is that they all seem like they're the kind of girls that wear the label. After the show I asked model Bella Hadid what it was like walking in the show. "It was really fun," she replied. Backstage images of models was proof of this. Familiar faces at this show included Binx Walton, Malaika Firth and Vanessa Moody. All these girls exude the presence and liveliness (despite not smiling) of a Topshop girl. That's one of the charms of the British label. Fantastic models who wear the clothes with a nice attitude. The clothes don't wear the models, which is the case of some shows. You could argue that Topshop Unique and other low-end designer brands decide the trends. After all, they’ll perform the best commercially. This collection featured many trends seen through a 70’s eye. However, the most important thing that a woman could take away from this collection is to wear their clothes unapologetically, with an ample amount of attitude.